For more than 28 years, the Law Office of Larry P. McDougal has provided experienced representation in criminal defense and personal injury. 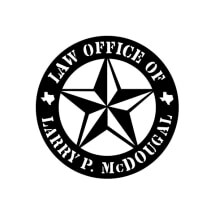 Practicing exclusively in Fort Bend County, Texas, Larry P. McDougal Sr. uses his law enforcement background and familiarity with the local courts to protect clients and solve serious legal problems. Our Richmond law firm serves clients in Sugar Land, Rosenberg and all of Fort Bend County. Larry P. McDougal Sr. has practiced law in Texas since 1990, and his son, Larry P. McDougal Jr. joined the firm in 2010. We are lawyers who work closely with clients to understand their situation and their priorities, so that we can provide custom solutions and help them make informed decisions. Larry McDougal Sr. has served as a police officer, a deputy sheriff, an assistant prosecutor and a municipal court judge in Fort Bend and Harris counties. The insights he gained from those positions are a big advantage to clients who are facing criminal charges. He uses his criminal justice insights and courtroom experience to help clients fight the allegations they face or avoid the worst consequences. Larry McDougal's professionalism and proven results have earned him the President's Award from the Texas Criminal Defense Lawyers Association and a seat on the Board of Directors of the Texas State Bar. The Law Office of Larry P. McDougal handles misdemeanor and felony crimes, including DWI and juvenile offenses. We extend a free, confidential consultation.